During these difficult economic times many families are struggling to make ends meet and put food on the table. The Goodie Boxes provide fodd boxes and meals for families at reasonable prices. "This doesn't solve the problem but our hope is that our service will help families that are struggling to make ends meet during these difficult financial times." Times our tough in the current economy and The Goodie Boxes was started by a group of individuals and entrepreneurs to help families make ends meet by distributing affordable food boxes in the Phoenix, Scottsdale, Arizona area. The goal is to provide healthy name brand meals for families in need. The Goodie Box consists of frozen food, meat, vegetables and bread as well as other name brand foods at a reasonable price. Available for pick-up monthly at one of our local community partner locations. The current cost of a Goodie Box is $37 and the average grocery retail value of the food is around $70 - $80. 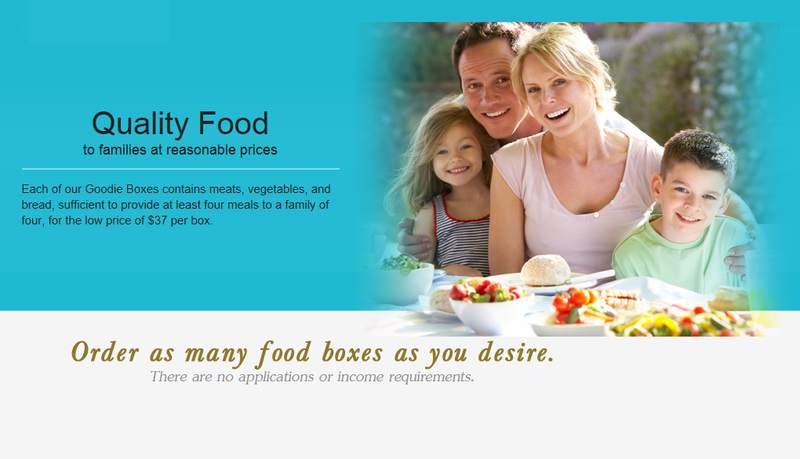 Each box of food is sufficient to feed a family of four up to five meals. The Goodie Boxes President Doug Johns states, "Our mission is to provide healthy food and meals to families in need at affordable prices. This doesn't solve the problem but our hope is that our service will help families that are struggling to make ends meet during these difficult financial times." The Goodie Boxes have started food distribution operations in the Phoenix Metropolitan market and the Phoenix, AZ. area with pick up locations in or near Phoenix, Scottsdale, Glendale, Tempe, Mesa, Maricopa, Gilbert, Chandler and Peoria Arizona. Expansion plans are underway with hopes of providing affordable food boxes in metropolitan cities across the US. More than sixteen million or almost one in five American children are at risk of hunger. These numbers are unacceptable and The Goodie Boxes was started in an effort to help. No American should ever have to go to bed hungry. People can donate a Goodie Box to a family in need by visiting The Goodie Box website. Menu, order and pick information is available on the website as well.